Awesome job on 2 signs needed ASAP. A-frame signs have been an effective form of advertising in multiple industries for over a century. 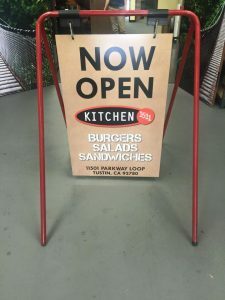 Also known as sandwich signs, they are a great investment as they are quite affordable but can boost walk-in traffic by getting the attention of passersby and directing them to your business. 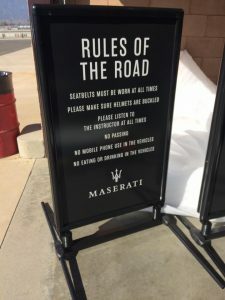 With a variety of sandwich sign options to choose from with Kanban Signs, your business can have the perfect sign to advertise products and services, promote special offers, and serve as wayfinders. Our A-frame signs come in various sizes; from as small as 12” x 24” signs to as large as 48” x 72”. You can also choose to have them in landscape or portrait orientations. Kanban Signs is a leading signs supplier and specializes in creating A-frame signs customized to fit your business needs, your business location, and, of course, your budget. Sandwich signs are known for their versatility. You can use them for many promotional opportunities, whether it’s a regular day, a tradeshow, a grand opening, a big sale, etc. With light A-frame signs, you can easily transport them, store them, and bring them out whenever needed. If you’re looking for lightweight and portable sandwich signs, Kanban Signs offers you a wide array of choices. We have signs as light as fabric…literally! 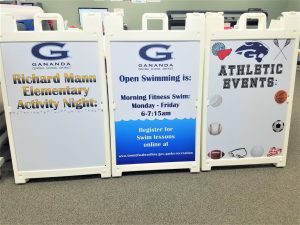 Kanban Signs offers pop-up signs made of water-repellent fabric, and these have full-color print on both sides to ensure that they catch the attention of potential customers wherever you decide to place them. Kanban Signs also offers wearable signs for businesses a more interactive form of advertising. We make our wearable signs as comfortable to the human billboard as possible, which is why they are made of light but durable corrugated plastic. If your aim is to attract walking traffic to your business, your A-frame signs need to be able to hold up against the wind outdoors. Though you can have them staked to the ground, there are also options to keep them in place temporarily. Kanban Signs can help you with that as we have a wide selection of signs specifically for the outdoors. We have sidewalk signs made of heavy steel for high durability and strong wind resistance so that your sign will stay effective even when exposed to nature. We have A-frame signs made from hard plastic. You can keep them in place and weigh them down by filling the frames with sand or water, which you can pour out after use. This keeps your signs stable when you need to use them, but still portable when you need to store them. 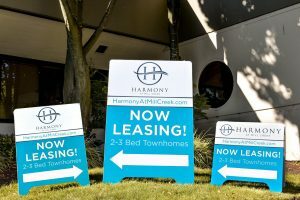 Kanban Signs wants to deliver the exact A-frame sign that your business needs. For our clients who look for signs with permanent designs, we deliver double-sided sidewalk signs with full-color prints permanently embedded. 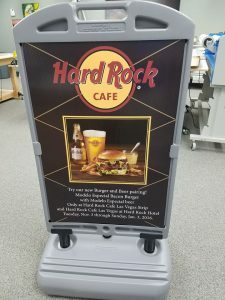 But if you’re looking for sandwich signs that bear temporary designs, Kanban Signs can provide you A-frame signs with inserts so you can get your designs printed and then simply slide them into and out of your frames as needed. We also have signs that have Velcro for easy fastening and removal of designs. Kanban Signs also offers write-on signs that gives your marketing a very personal touch. You can choose between blackboard or whiteboard signs for a creative approach to sidewalk advertising. Having worked on the signs of numerous clients, Kanban Signs is confident of the knowledge and expertise that we bring to the table. With our team of graphic artists and signage experts, we can offer you highly effective designs that come with our highly durable A-frames. Is it your first time ordering a sign? Don’t worry, we can walk with you through the entire process. From designing, printing, production, assembly, placement, installation, and even until maintenance, you can count on Kanban Signs to be of service to you. With our wide selection and reliable customer support, we are your best choice for A-frame signage. If you want to make customers out of passersby, give us a ring and we’ll have one of our senior signage specialists show you. Call Kanban Signs today at (619) 503-3634 for your Free Consultation with an A-Frame Signs Expert!